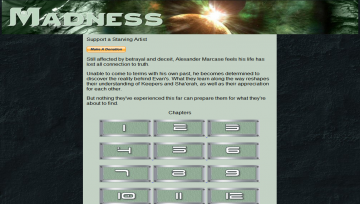 "Book 2 in Keeper Series"
Still affected by betrayal and deceit, Alexander Marcase feels his life has lost all connection to truth. Unable to come to terms with his own past, he becomes determined to discover the reality behind Evan’s. What they learn along the way reshapes their understanding of Keepers and Sha’erah, as well as their appreciation for each other. But nothing they’ve experienced this far can prepare them for what they’re about to find. Madness has not been tagged yet. Help others find Madness by tagging it! Madness has not been reviewed yet. Madness has not been recommended yet.